Miles Medina built six aqaponics systems in the FIU Organic Garden where he studied the effects of different feeds on aquaponic cultivation. During a routine stop at the grocery store, Miles Medina MS '14 had a random thought. Why couldn't the store grow the very produce it sells on its roof? That random thought led Medina to explore the world of aquaponics, a journey that has earned him first place for his master's thesis in "Outstanding Thesis in Food and Agricultural Science Competition" hosted by the U.S. Department of Agriculture-National Institute of Food and Agriculture (USDA-NIFA), American Association of Hispanics for Higher Education (AAHHE), and Texas A&M University-Corpus Christi. "After doing some research, I learned a start-up company based in New York City was trying to do just that with hydroponics. I looked into it and didn't feel satisfied that hydroponics could reduce the negative environmental impacts associated with agriculture," Medina said. "Then I discovered aquaponics and became really interested in getting some hands-on experience and contributing to the research being done on it." Aquaponics is a food production system that integrates aquaculture, or raising aquatic animals in tanks, and hydroponics, or growing plants in water. A basic aquaponic system is made up of a fish tank, solids filter, biofilter and vegetable grow bed. Water is pumped from the fish tank to the solids filter where bits of waste are removed. The water then flows through the biofilter where naturally occurring bacteria break nutrients down into inorganic forms that feed the plants in the vegetable grow bed. Finally, the filtered water returns to the fish tank and the cycle continues. According to Medina, aquaponic farmers tend to rely on aquafeeds, or fish feeds, that are rich in phosphorous and nitrogen and formulated for fish-only aquaculture. "Although what the fish excrete is good fertilizer for the plants, it's not perfect. Oftentimes, you end up having plants that eventually show certain nutrient deficiencies," Medina said. "That's what motivated me to do this study. I wanted to compare the difference in how the plants grow based on the feed that's given to the fish. No matter what, fish waste is always good fertilizer, but there's always room for improvement. There's always the opportunity to find what's missing." 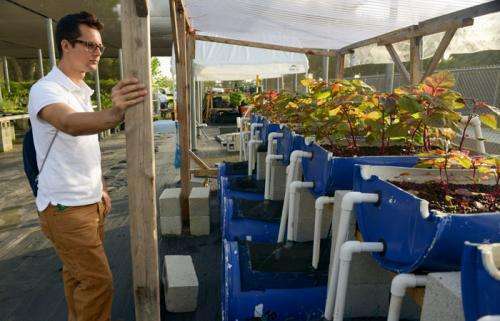 Medina designed and built six aquaponic units at the FIU Organic Garden in order to compare the effects of two aquafeeds – one formulated for fish-only aquaculture and one plant-based feed formulated for aquaponic cultivation. Using blue tilapia and red amaranth, a nutritious leafy vegetable, Medina found aquaponic farmers can achieve higher crop yields using less nitrogen and phosphorous inputs. In other words, aquaponic farmers can produce more crops by using a plant-based feed formulated for aquaponics cultivation. Medina also found the improved crop yield from the lower-protein aquafeed can compensate for associated reductions in fish yield to increase total aquaponic farm revenue. "As our global population increases and more of us live in cities, we have to find opportunities and develop new ways to provide for ourselves in a way that's environmentally sustainable," Medina said.